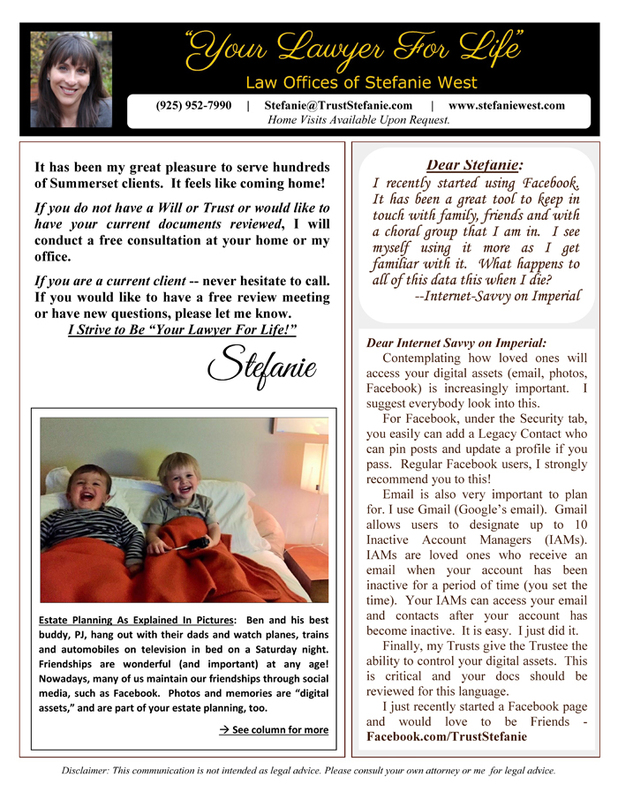 Above you can read my previously published newsletters. 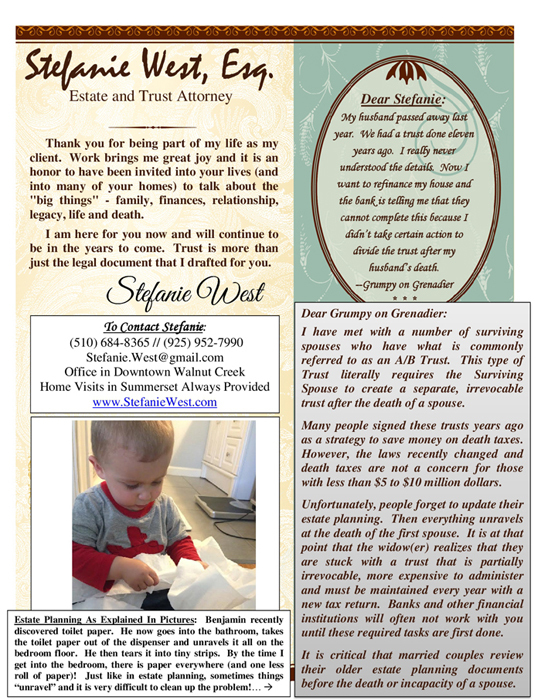 Throughout the years I have answered many questions regarding Estate Planning and Elder Law. 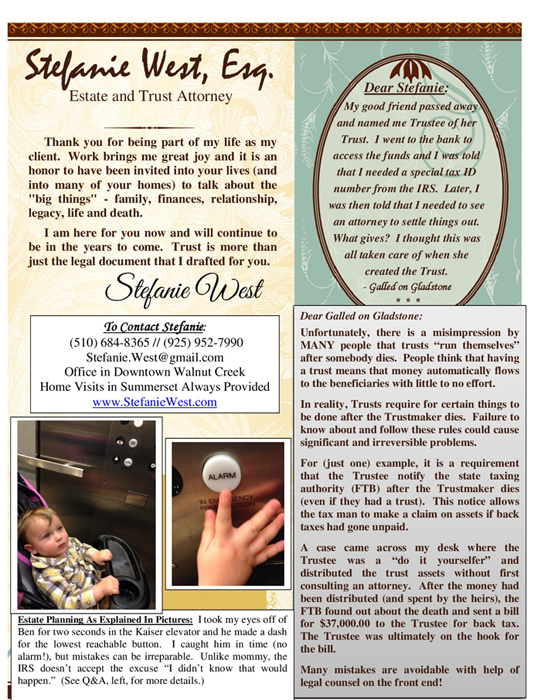 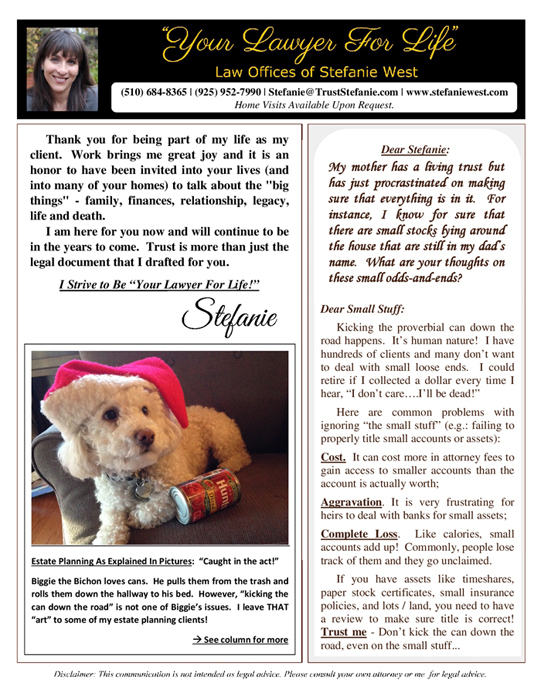 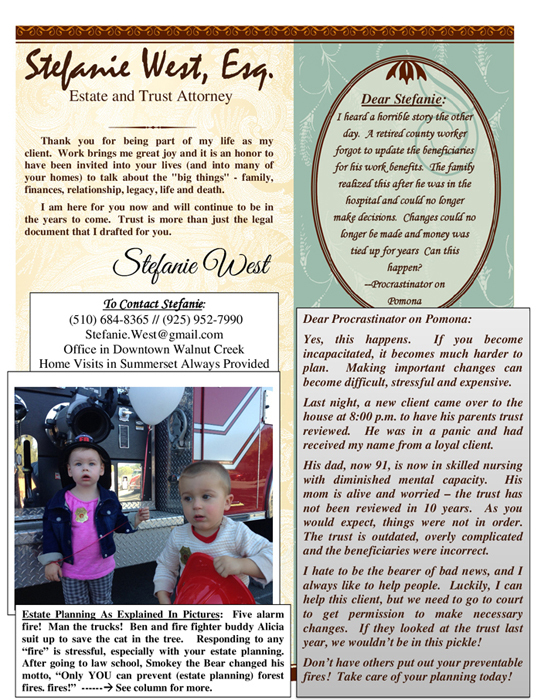 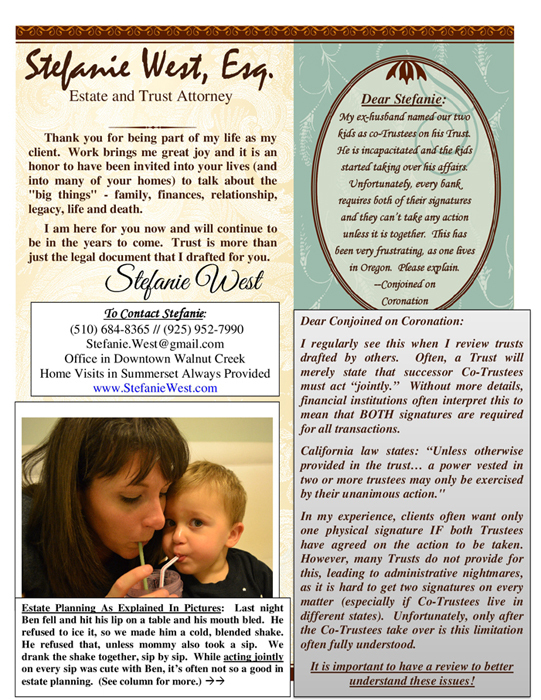 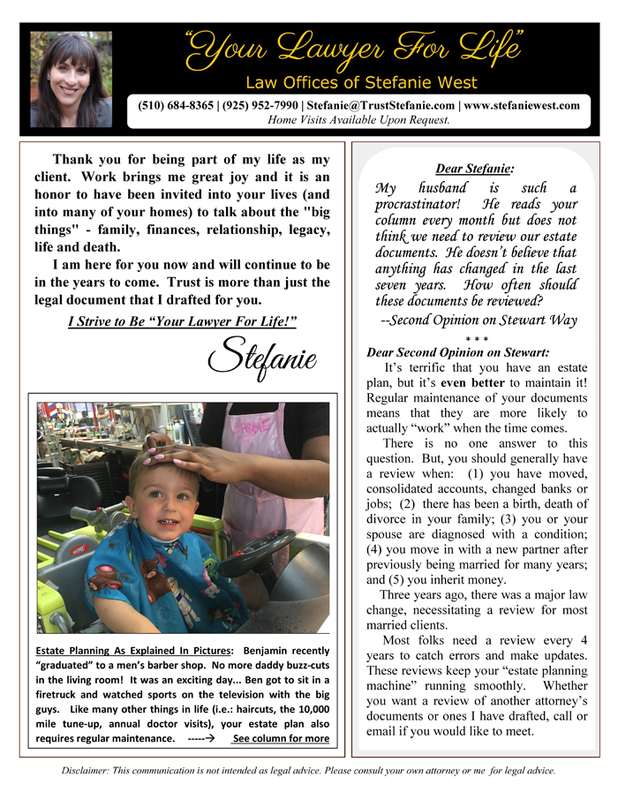 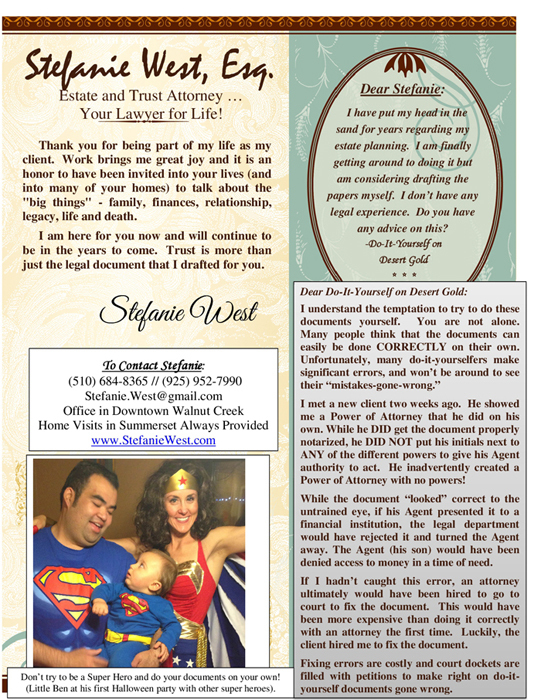 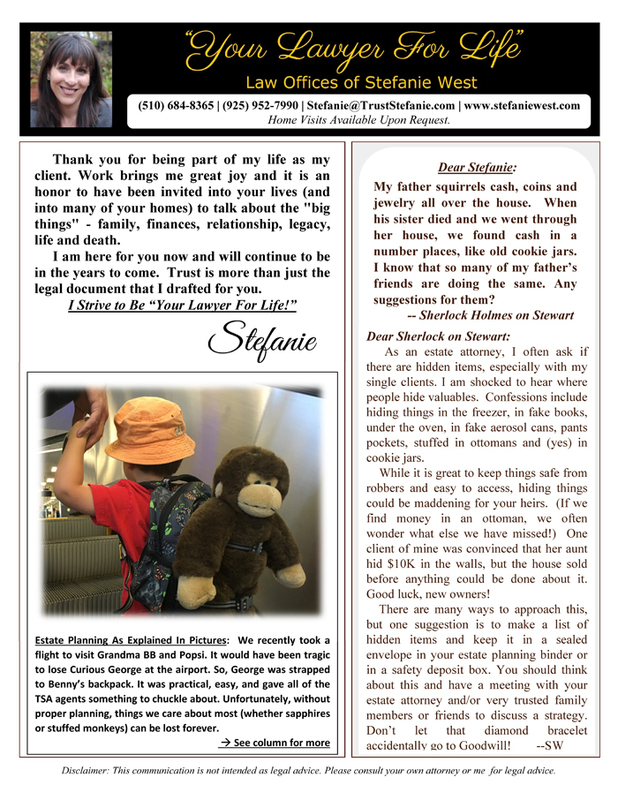 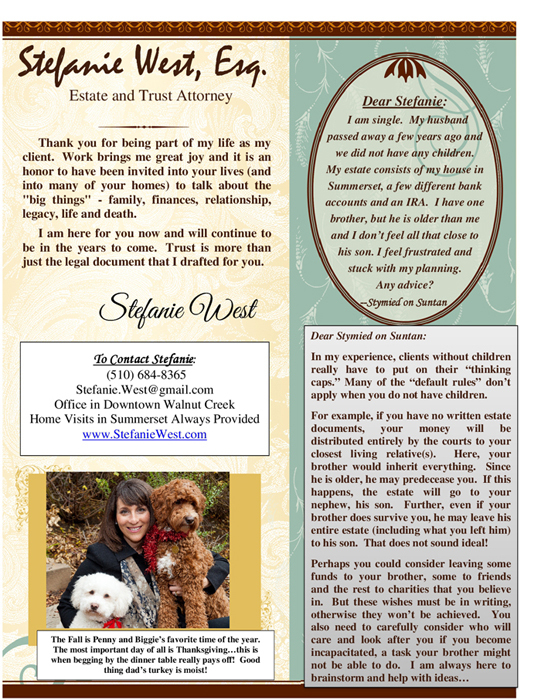 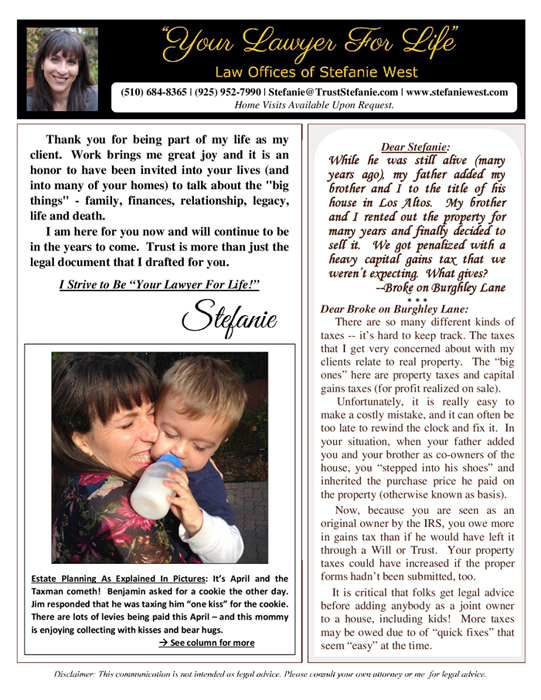 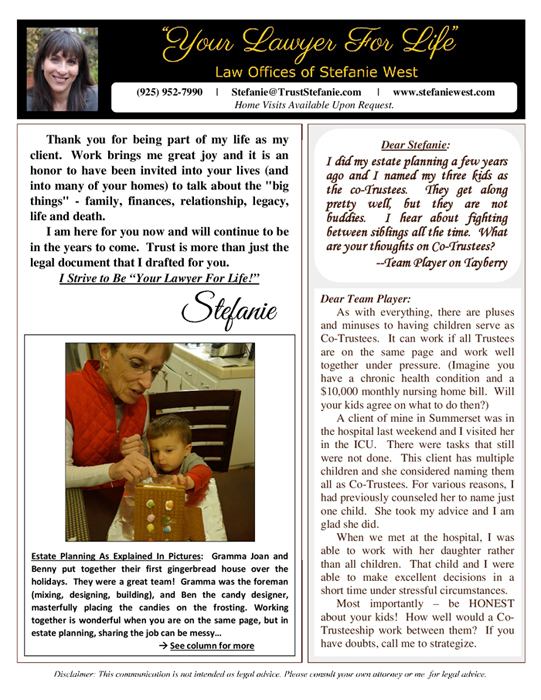 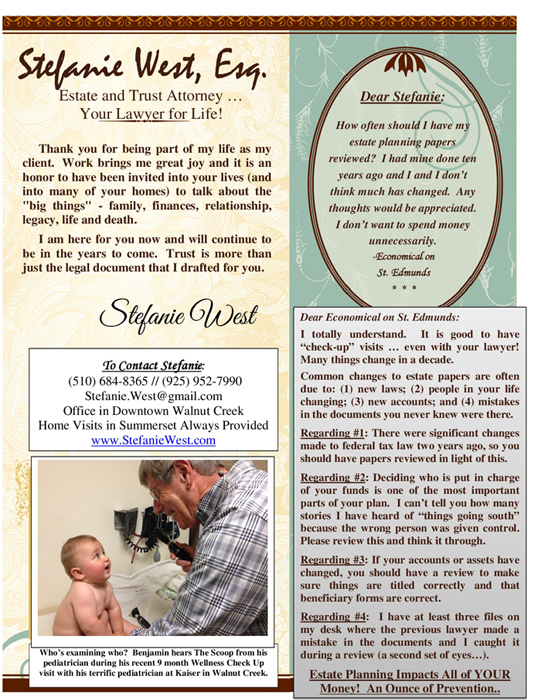 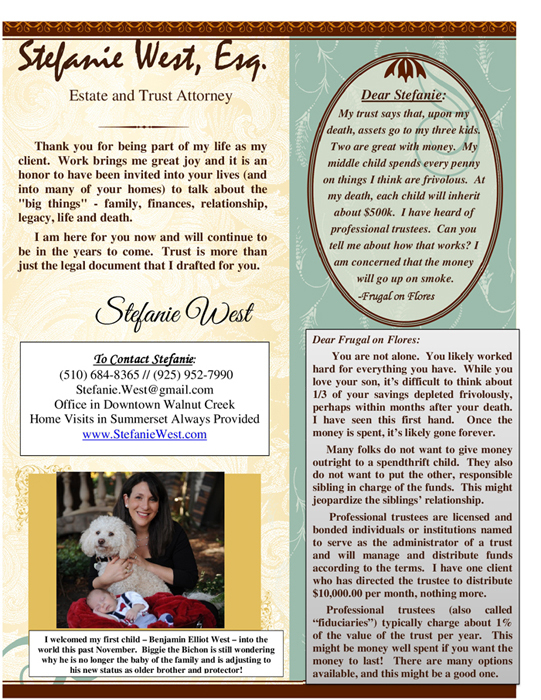 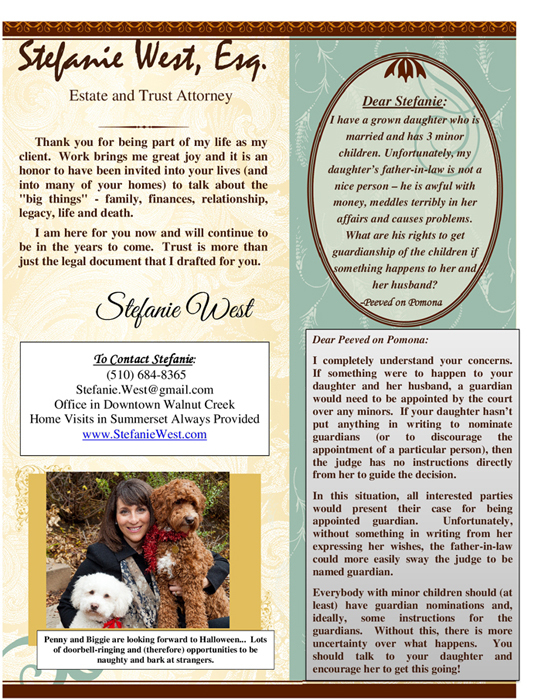 THE LAW OFFICES OF STEFANIE WEST, INC. 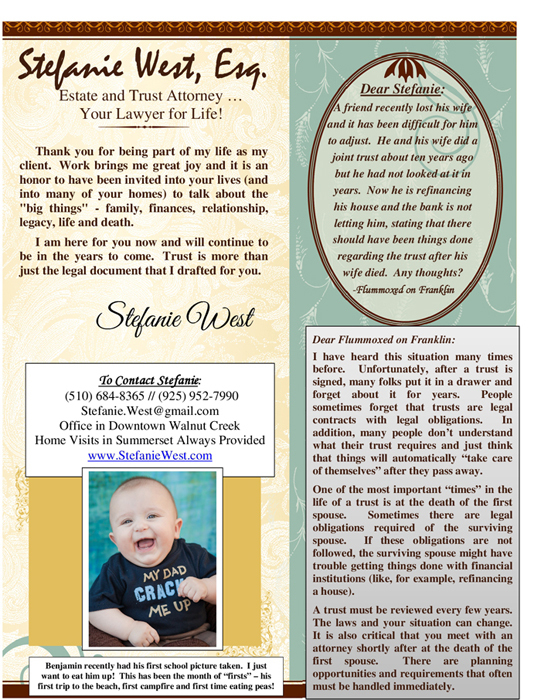 Copyright © 2018 The Law Offices of Stefanie West, Inc. All rights reserved. 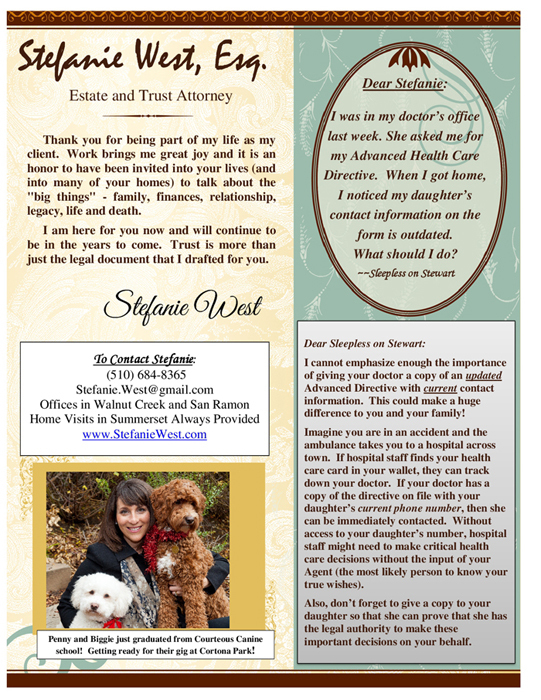 This site is sponsored by THE LAW OFFICES OF STEFANIE WEST, INC. Stefanie West is licensed to practice law in the State of California. 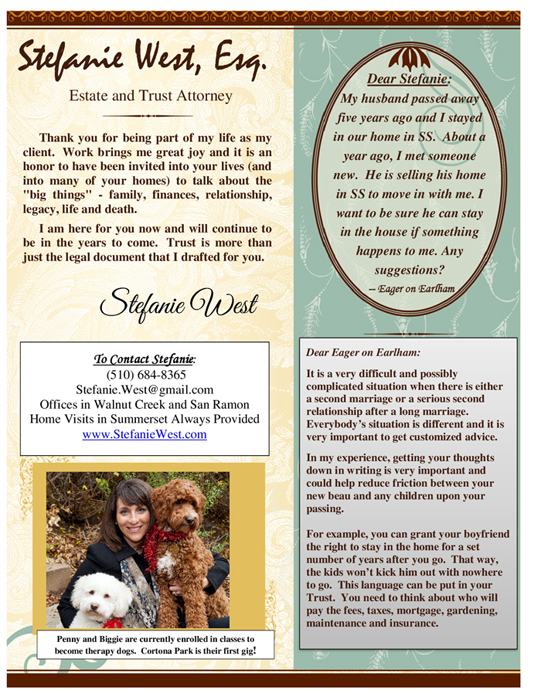 Our transmission and your viewing of this site or any other web site sponsored by THE LAW OFFICES OF STEFANIE WEST, INC. does not create an attorney-client relationship between you and THE LAW OFFICES OF STEFANIE WEST, INC. 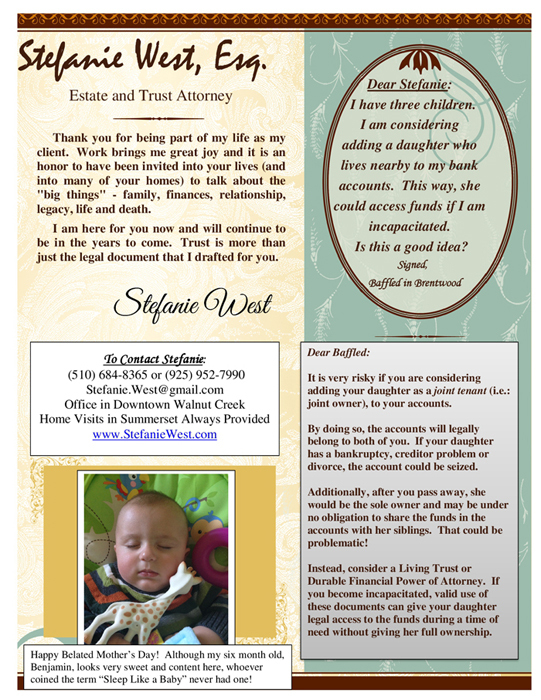 The materials on this site are intended for general informational purposes only and do not constitute legal advice. 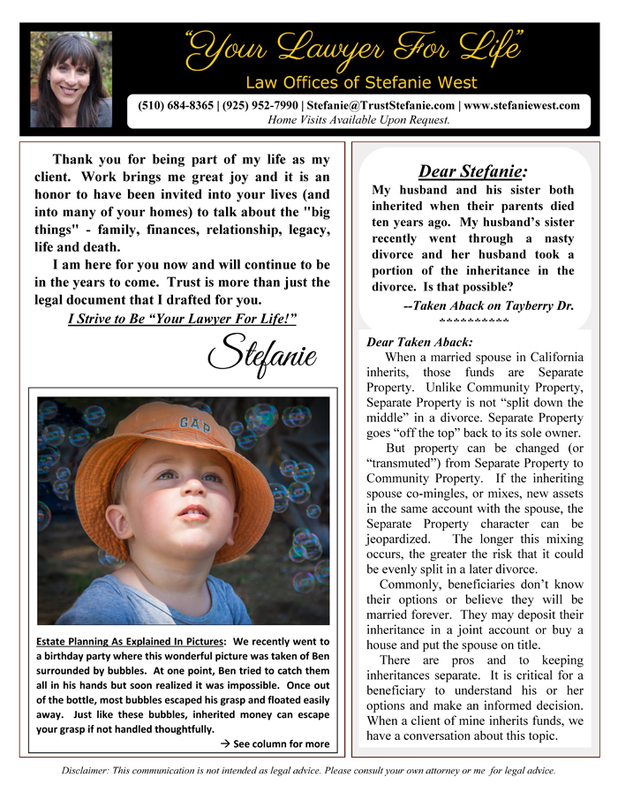 The content of this site may not reflect the most current legal developments and may be changed, updated or removed without notice. 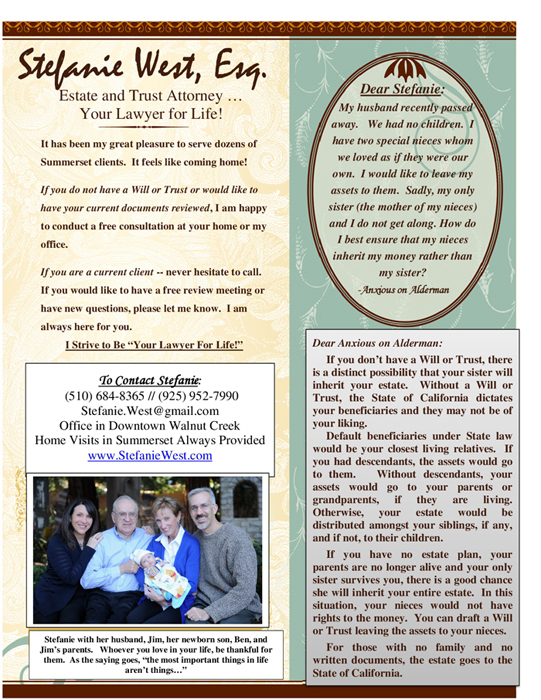 Do not consider this site to be a substitute for obtaining legal advice from a qualified attorney licensed in your state or country, and do not act or refrain from acting on the basis of the information contained herein. 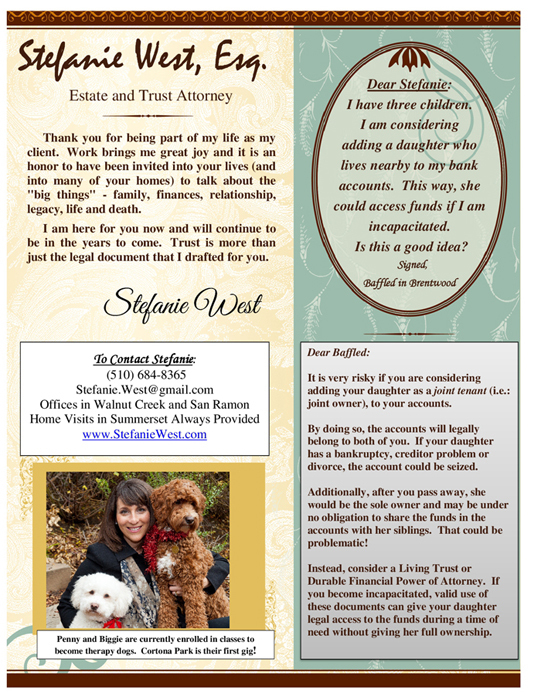 THE LAW OFFICES OF STEFANIE WEST, INC. is not responsible for any errors or omission in the content of this site or for damages arising from the use of this site under any circumstances. 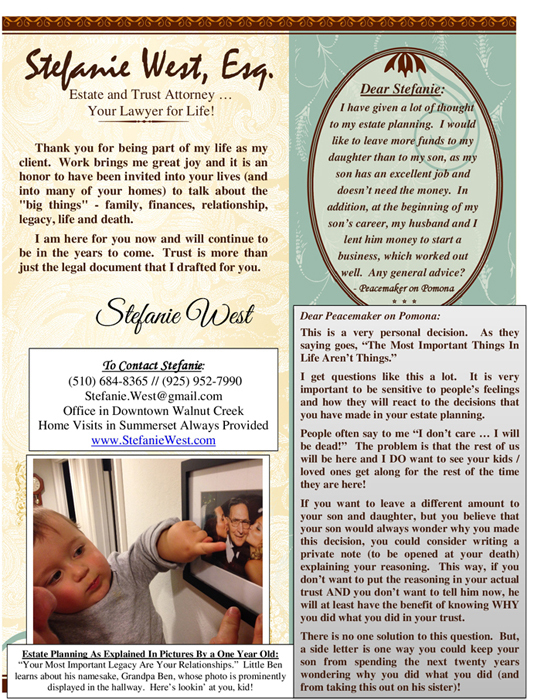 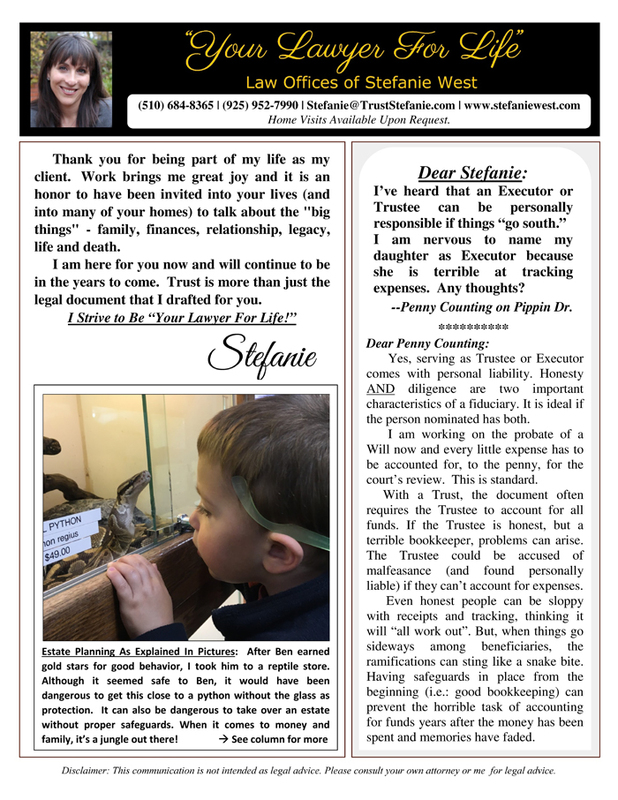 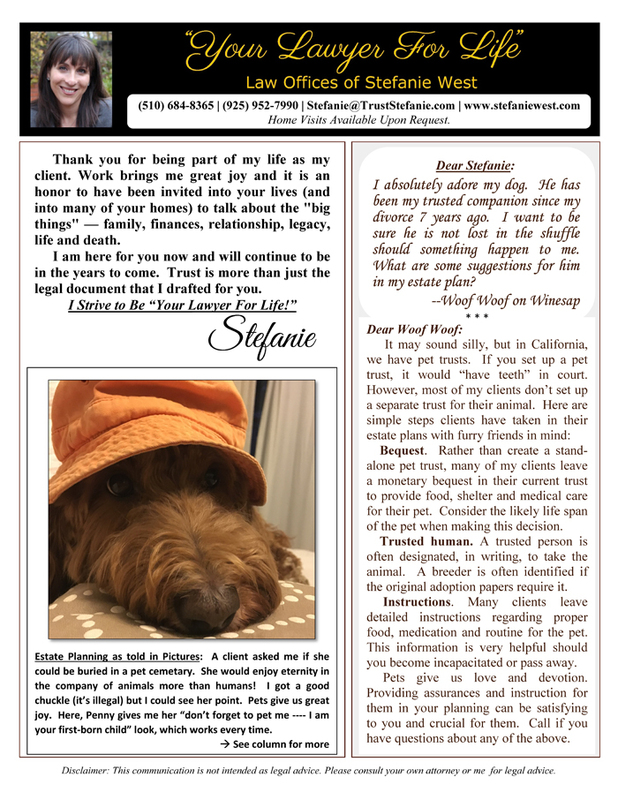 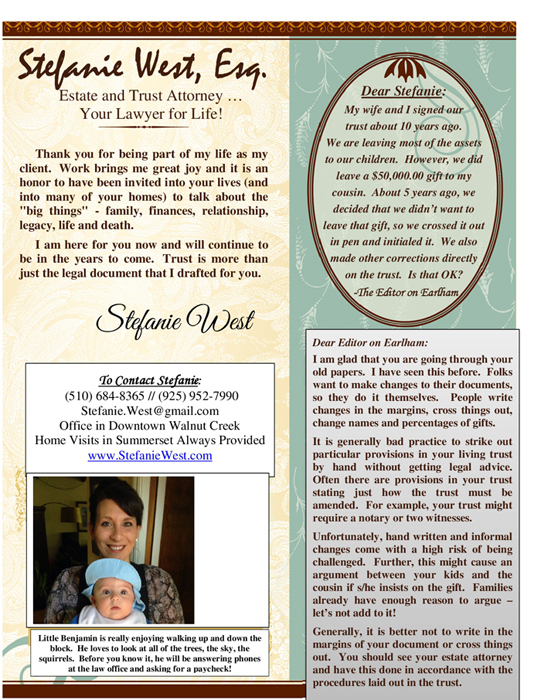 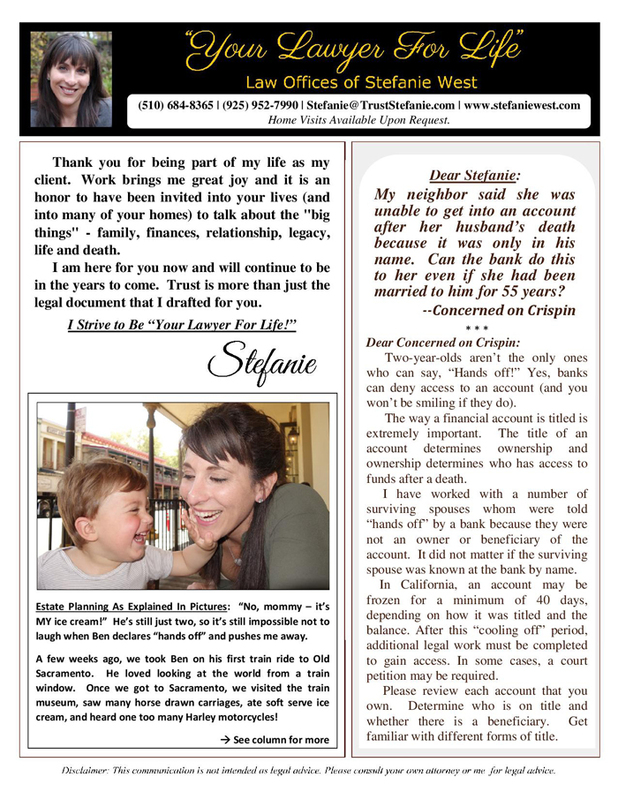 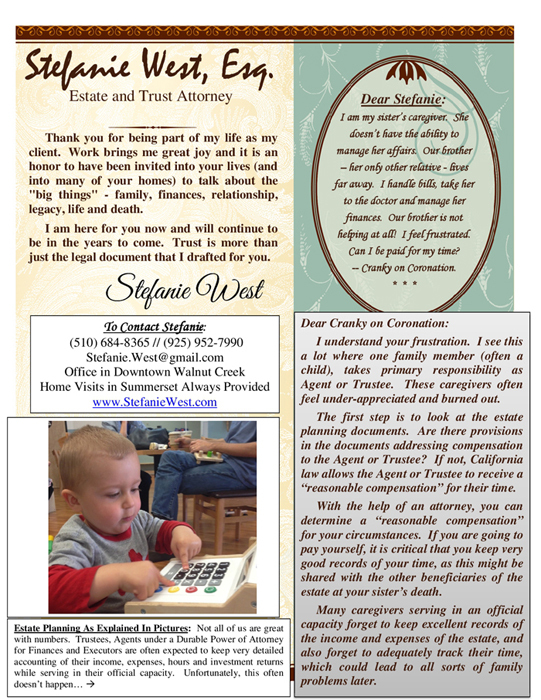 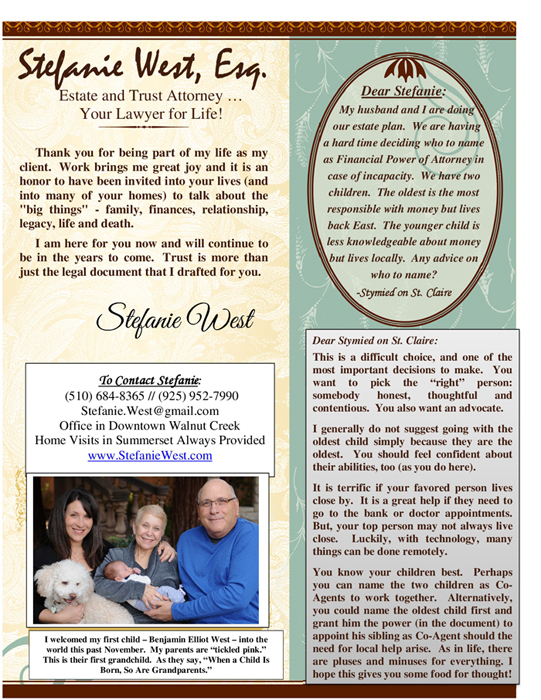 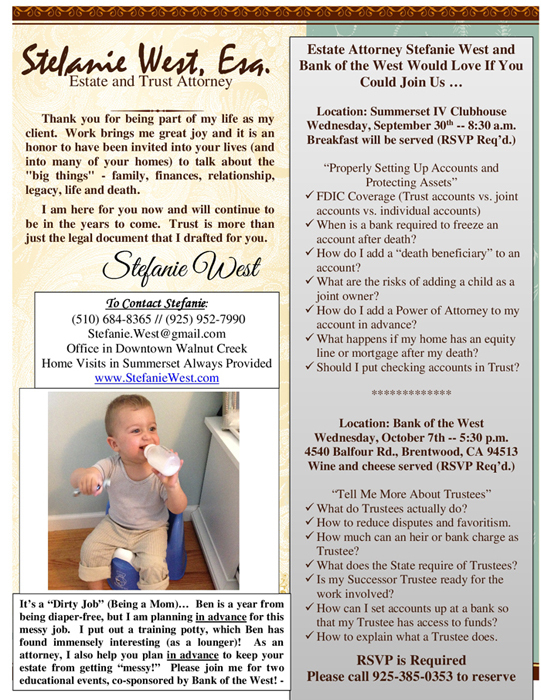 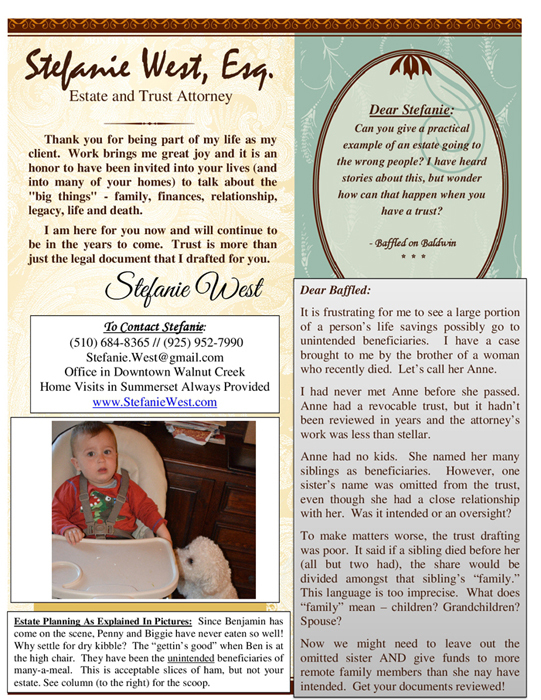 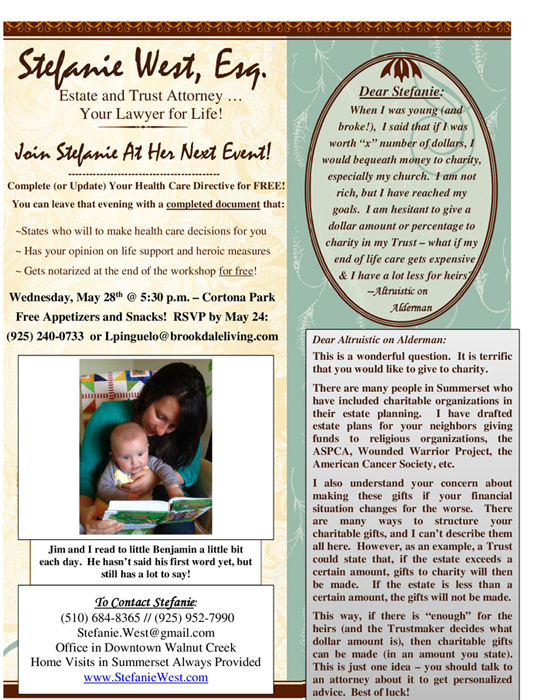 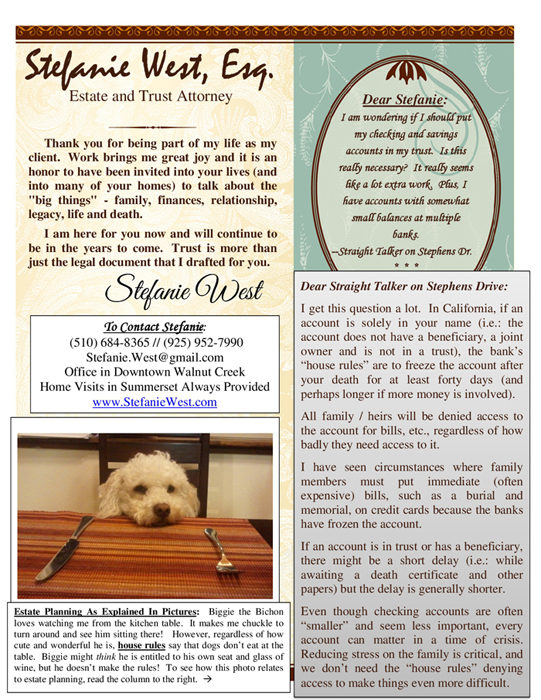 THE LAW OFFICES OF STEFANIE WEST, INC. assists clients with Estate Planning, Elder Law, Special Needs Planning and Probate/Estate Administration in Contra Costa, Alameda and San Francisco Counties.